We had the pleasure of chatting with Clary Fray herself, Lily Collins at The Mortal Instruments: City of Bones press junket on August 9 in Los Angeles, along with Page to Premiere and TMI Examiner. Lily opened up to us about the long and arduous journey she went through to get to this point, how thrilled she is to interact with fans, the challenge of having to convey an array of emotions as Clary, and how Jonathan Rhys Meyers as Valentine genuinely terrified her. Can you talk about the process you’ve gone through with this project? Lily Collins: I was a fan of the books before I was cast and so it was a story that resonated a lot with me. The relationship with her mom, I’m super close with my mom. The fact that she’s never victimized. She’s passionate, compassionate, loyal. All these attributes that she has are so important to me in a character. And the opportunity to be an actress to play a character like that is one that you just don’t want to give up. You don’t want to threaten that. The idea that I was signed on for three years I think everything happens for a reason. It allowed me – because it kept pushing or changing hands – it allowed me to do Mirror Mirror, The English Teacher, Stuck in Love and other projects that had it gone when it was originally supposed to go I wouldn’t have had the chance to do. I think it fell into the appropriate hands and casting worked out. At that time, Jamie (Campbell Bower) they were looking at going into a second season of Camelot and had it gone at that time he may not have been able to do it. And I can’t ever imagine Jamie not having been Jace. It’s like Kevin Zegers playing Alec and Jemima (West) and Robbie (Sheehan). Like everyone that became a part of the project did so organically and for the right reasons. I’ve just always loved the character. I never wanted to give it up. And luckily they didn’t make an ultimatum like, ‘Either we go now or you can’t do it.’ It all just really happened. It’s always had this positive glow about it. Nothing really bad ever happened with it. In the movie your character is thrown twists and turns every five minutes. What was it like portraying that? LC: Oh my God, that’s what I was probably most nervous about. As a reader of the books, you really love the fact the she is so tenacious and yet she shows this vulnerability. When you read somebody reacting to this news every five minutes obviously you can be upset because of anger, frustration, fear, hesitation, confusion. There’s so many emotions that you could play. As the actress every five minutes wanting to play her never as a victim and also allowing her to show vulnerability and reacting different ways every time she’s thrown something, that’s hard to think about playing. You want to show this journey of her character and you don’t want it to be one note. You don’t want it to be fear all the time or sadness all the time. It was kind of pinpointing exactly which emotion at which moment she was showing. I think the script itself did a great job of allowing moments of vulnerability and Jace taking over for her or at least emotionally helping her get to a place where he’s like, ‘You have to come with me.’ Because why would a girl who’s seen what she’s seen really willingly go with a guy like that? She has to have a breakdown moment, which she does in the film and he lifts her up. But then at times she has to combat him with his comments, like a Katharine Hepburn-Spencer Tracy, which she doesn’t take his crap. And she’s like, ‘Wait a second. Now this is actually what I need to do and what I want to do and this is how I’m going to do it.’ So it really was a challenge to come up with different inspirations for each emotion. But I think once we did that it kind of flowed a little bit better as opposed to being stop-start. It’s never like, joke here, fear here, confusion here. It’s very much kind of a normal – as normal as a teenage girl going through an identity crisis would be. I mean teenage girls are all over the place anyway, and so I think it’s ok for Clary to be like that. It’s ok to be confused. How has it been interacting with fans at WonderCon, ComicCon and the mall tour? LC: How crazy is that?! I think it’s crazy that we got as many fans as we did at each location wearing costumes, fainting or crying and the first one hasn’t even come out yet. I kept saying to them, ‘I really hope you like what I’ve done,’ because everyone has this idea in their heads of what it is. No one has seen the movie, it’s not the sequel yet. But seeing that passion I think – not that any of us needed re-igniting passion-wise – but it just furthered the excitement. It’s felt like this progressive up, up, up, up anticipation. And then it’s like going to be next Monday and you’re like, ‘Woo, the premiere!’ I think when I did Mirror Mirror, for me, the best thing was having little girls come up to me and be like, ‘Oh my God, you’re Snow White.’ It was seeing the little girls that loved the story so much. For this movie, the best part has been going to these malls and interacting with true fans and the readers of the books and those people that are going to buy tickets. Meeting the parents that have slept overnight with their kids and they’re like, ‘Oh my God, my daughter is a huge fan,’ and I’m like, ‘You’re the best mom ever.’ And they bring their friends and they get so excited for like two seconds of interaction time with us. It’s been the most humbling and exciting experience to just be one-on-one with people. I never thought I’d get the chance to do that. I didn’t do that with any other movie. It does kind of go, Wow, this is just for the first one.’ Obviously we’re starting the sequel next month so I’m sure we’ll be doing something like this again. Like, how can we top that? It was really cool though. Was there an added sense of pressure with the built-in fan base? LC: I didn’t know how big the fan base was when I signed on three years ago. I literally was a fan of the books, saw that Stephenie Meyer had that quote on the front and I was like, oh, wow, obviously it’s got a fan base. But I had no idea because I’m not in the whole social media world like at that point also I wasn’t very aware, and all of a sudden social media blew up. Like blogs and Twitters and Facebooks about my casting and my hair color was wrong like all of these things and I was just like, Oh my God, I had no idea. I knew it had sold over 22 million copies, and obviously that number has become that number since the movie was being made. Like I just had no concept of how many true fans there were. I didn’t sign on for that reason. I thought, wow, this fantasy world, this character, why would I say no? I love her and I love the world she lives in and I’ve always wanted to do something like this. And I love the dark undertone. I’ve always loved dark, grittier, edgier, gothicy things, and so the blending of the two worlds together was so intriguing to me. But I had no concept of the fandom until I was cast. Then when Jamie (Campbell Bower) was cast and the whole backlash and it was just like [gasp]. For every positive comment you find two or three negative. But that’s always what it’s going to be like and, again, I was a fan so I can’t say as a fan that I wouldn’t have had an opinion on actors that were cast, too. I wouldn’t have tweeted about it, but as a fan you always have an envisioned person in your head and if that person’s not who gets cast a lot of people can’t see past the fact that there’s going to be hair and make-up and wardrobe. That’s what makes me laugh so much is when certain people are cast and they’re like, they look nothing like the character and then all-of-a-sudden they see the first image and they’re like, oh my God, that’s it! Yeah because it’s hair, make-up, wardrobe, acting. You’re an actor because you take on these different roles and it allowed me to see all of that in action from a fan perspective and the actor perspective. Being a part of the production so early on and being involved in casting and involved in writing certain things in the script. The involvement was really important for me over that span of time because any nerves that I had originally with this kind of interaction with fans it was able to be kind of smoothed out. 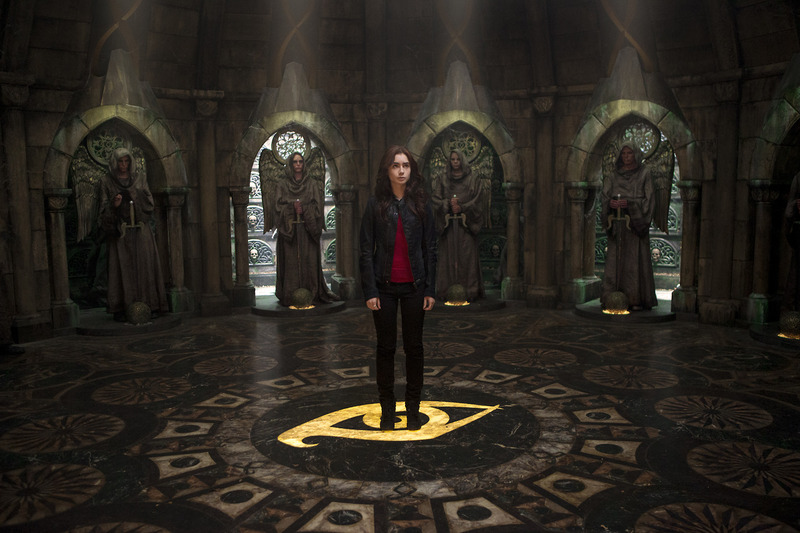 By the time I started filming, I already felt like I was Clary because I’d had all that time. How was it like working with Jonathan Rhys Meyers? Because he is scary in this movie. LC: Isn’t he scary?! Honestly, he’s like the coolest guy. He’s super sweet, not a mean bone in his body, but he is the definition of intense. When he walked on set everyone just froze because he brought that intensity that only Valentine can. It was perfect because in the scenes with him I was genuinely terrified of him. He would improv things. Like when I’m standing there and he has the [Mortal] Cup and he’s like, ‘Drink it,’ and I’m like, ‘I’m not going to drink it.’ And then he added that ‘Drink it!’ That was totally not scripted and that’s why I’m like shaking. He did that all the time with things or he’d like make a motion and then I’d jump. He really became Valentine and I was genuinely terrified. I think when he came into the set, with the scenes with Jamie and I and him, it just elevated our fear but also elevated our performance because he brought something totally new to the table. He’s like the perfect Valentine because he’s just so alluring and appealing but at the same time so evil, and that’s what Valentine is. I think he was drop-dead perfect casting. Can you talk about your involvement in the whole process with getting this movie to the big screen? LC: It was a different director and I think it was way more CGI heavily based at the beginning, and then when Harald [Zwart] came on it really became character and emotion and the CGI was like icing on top. It felt way more real and raw of a script the second time around because it wasn’t reliant on a lot of post-production things. The Jace auditions started with the original director [Scott Charles Stewart], who is a lovely man. Again, things happen for a reason. It just changed hands. He’s a fabulous person. I read with a couple of guys before Jamie and I had actually put Jamie’s name up for it from the get go because I had met him years ago. But I had always felt like I’ve known him for longer than I have. Like it was this weird kind of – you know when you meet someone and you’re like, ‘I swear I know you.’ That’s how I felt with Jamie and so I just put him forward. I didn’t realize he’d already gone in for an audition and then he came in for the read and he came in and just – literally as he was walking in – we just knew, well I knew. Him as Jamie was Jace. He didn’t need to act. He already had all the qualities there and not to mention he looks like a Jace. It just all kind of worked out. So he was cast and then we were both on it for a long time with no real other progress. I’d never started reading with Simons until it was announced that we were starting again with Harald. And then I read with a couple of Isabelles. Never met Jemima. She was cast. I’d never read with her, but she was cast and then the other people I didn’t read with. It all just kind of just then – once the ball starts rolling people are cast left, right and center. Kevin [Zegers] was cast like two weeks before we started shooting. He said that he got flown to Toronto, had a wardrobe fitting, still didn’t know the film was his and he left going, ‘I think it went well.’ He didn’t even know that he was cast. It really just all kind of happened – the ball rolling. It was just great to be involved with some of the rewriting of it. I had a meeting with all the scriptwriters and we just sat there and they literally were like, here’s the script, come back tomorrow and let us know some notes. I went home, took a bunch of notes and then everything was taken into consideration. Having Cassie (Clare) on set there was amazing because near the end of shooting, the ending started to change on how we were dealing with the end of the movie. Jamie and I were like – we felt so strongly about how certain changes were affecting the characters and we brought it up to Cassie and she agreed with a lot of it. She literally overnight rewrote it, submitted it and we all talked about it and collaborated and the ending is what the ending is now. It’s kind of amazing that you can do that on a set and have the ability to have people believe in you enough to have that input. That really was amazing especially for the sequel. It’s like, wow, what are we going to be able to put together this time? What are you most looking forward to in the sequel? What every day mundane tasks do you think runes would be really useful for? LC: Doing up the dishes, laundry. I would love a rune that could just transport you anywhere, anytime so for all these mall tours we wouldn’t have to go to so many airports. Honestly, the getting to the airport and the packing takes longer than the actual flight itself. If we could just be there we could go to so many more malls, think about it. We could do all 50 states. It would be so much easier. There is a rune to transport you. Just saying.